My mom called me the other day to tell me about a video she had just watched. She was excited because it talked about controlling weeds and she knew that was a main issue in our garden because it is so GINORMOUS! I was immediately interested and headed to the website to take a look. My Internet has not cooperated enough to allow me to watch the entire film yet, (so I ordered the DVD) but I have seen parts while in town and at home, enough to get extremely excited about the concept. 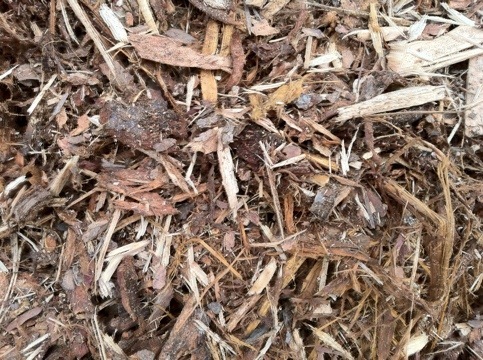 This man uses Wood Chips as mulch in his garden. 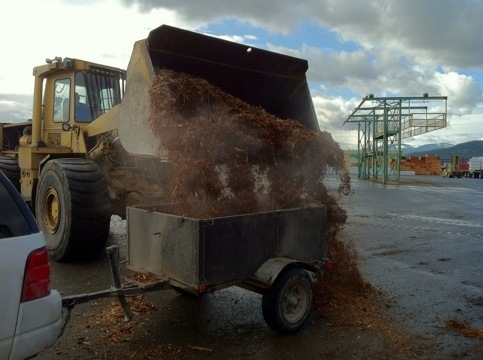 The concept is that the ground is covered, the wood chips are not mixed in, and this keeps the moisture in the soil, and suffocates the weeds. There are a lot of beautiful spiritual applications as well, and he has studied nature and how the natural world grows trees in the forests, etc., without formal irrigation, etc., and he has implemented these concepts into his garden and has amazing results. I know it’s not a new concept to lay down a mulch in a garden, but wood chips are more permanent, don’t blow away with the wind, and take years to beak down. When they do start to begin to break down, the soil becomes beautiful, light, and from the looks of this man’s garden, and his pH test results, the soil will grow anything with success and vigor. I was already devising ways to stop the weeds before they grew this year, and had bought a whole lot of straw bales to lay straw down all over the garden area. But now, I’m going to lay down some chips. 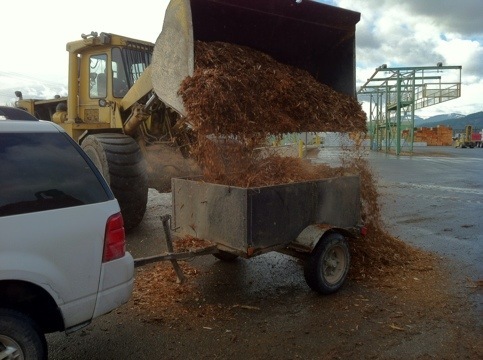 I didn’t waste any time going to the local lumber yard to secure a small load of wood chips in my trailer. 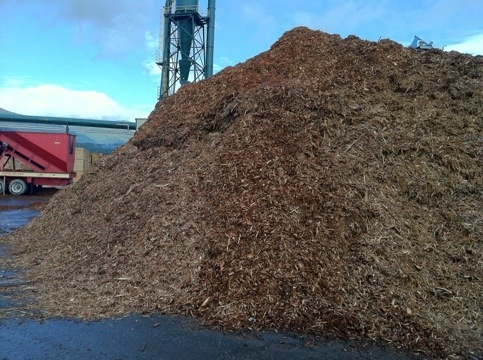 They actually didn’t want to sell me any of this pile because it is what they use to burn and create energy, and their supply is low right now. But since my trailer was so small, they charged me $10 and filled it up. These are not the pretty kind used in playgrounds and landscaping. 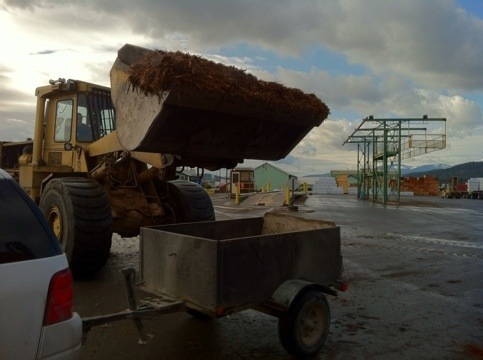 That stuff costs $100/ton. But they are what I wanted…ground up branches, leaves, basic organic material from all different types of sources. The dumpster (what is that thing he’s driving?) driver piled it as high as he could. By the time I got home, it was a couple of inches below the edge of the trailer from all the jiggling as we traveled over the road. I can’t wait to get started. 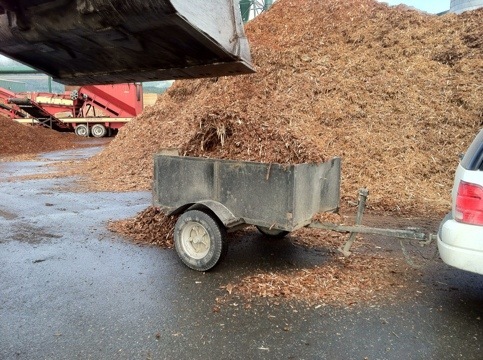 We’re initially going to lay down newspaper on a dormant bed, 4×46 ft long, that we don’t plan to plant this year, and mulch it with these chips. I can’t wait to see what the ground is like next summer after all the snow, rain, and worms do their magic. I also plan to put some in my pathways and around some of the vegetables that come up in the garden beds. It should be a fun experiment. I am mostly eager to see the weeds be suffocated. Let’s hope it works, at least, for that!! This entry was posted in About Us, Garden. Bookmark the permalink.